Drop Tables will be provided. Registration is NOT through our website for this Portugal Seminar. Please contact Dr. Dan at the email above. ***Note*** Please put Thompson Quebec in the Location section of the registration form to eliminate confusion from our other Minardi Education Seminars. ***Note*** Please put Thompson Toronto in the Location section of the registration form to eliminate confusion from our other Minardi Education Seminars. ***Note *** Registration is NOT through our website for this Hong Kong Seminar. Please contact Dr. Pak at the email above. The Thompson Seminar Series - Minardi Integrated Systems has been taught all over North America, and are looking to expand all over the world in the next ten years. We welcome suggestions as to future seminar locations. Our material is presented over three weekends in a workshop format. A unique interactive workbook is utilized. 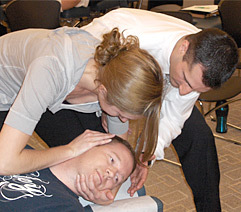 The first weekend (Module I) covers the basics of applied neurology and the essentials of the application of the analysis and adjustments used in Thompson Technique. Module II presents the more advanced and intricate aspects of the technique. Module III focuses on pediatrics and working with the extremities. There is a written and practical exam held on the Sunday of the Module III weekend. The Seminar Series prides itself with intensive hands-on participation, ensuring the doctor will be able to confidently use the material in an office setting immediately. Those familiar with Thompson will learn more than they ever thought possible. Those new to the technique will be taken from step one and accelerated at a comfortable pace to learn all material presented. BCS; modified toggle board adj. BCS; modified supine lift adj. Unilateral occiput; toggle set adj. D-; Modified Stucky 1 part adj. D-; Modified AI sacral push adj. Note: Costs above include all three Modules, accompanying manuals, and a copy of Dr. Minardi' textbook, entitled "The Complete Thompson Textbook - Minardi Integrated Systems". **Registration is limited and is on a first come, first served basis. Only Chiropractors and Chiropractic Students are allowed to register for the seminar series. If you are a Chiropractor enrolled as a student in a different field, this does not qualify you for the student rate. 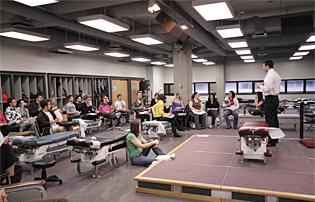 Only students registered in a Chiropractic College/University qualify for the student rates. REFUND POLICY: In the event that you cannot attend an entire seminar series or individual seminar that is prepaid, the fee for that seminar(s) may be applied to another seminar(s) within 12 months of the missed seminar(s), provided that proper notice is given to Dr. Minardi. There are no refunds once payment is processed. No transfers are allowed. I understand and agree that the photographs, film/video recording, audio recording or electronic recordings of me, my image and my likeness may used for publication and for other John Minardi and Minardi Education Seminars publication/productions in the future. I do not place any limit on the period of time in which the photographs, film/video recording, audio recording or electronic recordings of me, my image and my likeness or information may be used. I understand that I will not receive any payment from John Minardi and Minardi Education as a result of the distribution, showing or other use of photographs, film/video recording, audio recording or electronic recordings of me, my image and my likeness or information. I give my consent with the understanding that I may or may not be identified by full name in any photographs, film/video recording, audio recording or electronic recordings of me which are made. I understand the photographs, films/videos and audio recordings are owned by John Minardi. BY MY REGISTRATION FOR THE SEMINAR, I CONSENT TO ALL THE ABOVE!